To start, in case you’re wondering, “chi” is pronounced like the “chee” in cheese. Created by Danny Dreyer, the ChiRunning/Walking is a technique that blends movement principles from the ancient martial art, T’ai Chi, with the active sports of running and walking. This blend creates a more mindful, centered and balanced approach to fitness, however, that does not mean that ChiRunning is slow running. This technique can actually help you run further and faster, by being more efficient. Below are descriptions of the main principles from Tai Chi, and how they’re used in ChiRunning. Alignment & Relaxation – The main themes in ChiRunning are alignment and relaxation. This is demonstrated by the Tai Chi principle of a needle in cotton. The needle represents a strong tall posture, that provides structural support for all your moving parts, arms, hips, legs, to move softly around, like fluffy cotton. Have your legs every felt like soft cotton while running? The more you’re able to relax body parts that do not need to be tensed, the more effortlessly, and efficiently you’ll be able to move, and avoid injury. 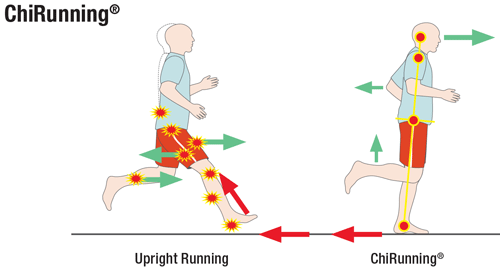 Cooperate with Forces – Most runners are unknowingly making running more difficult for themselves by working against two forces: the force of gravity, and the force of the oncoming road. In Tai Chi, you cooperate with opposing forces, in order to neutralize them. In ChiRunning, you also cooperate with forces. You cooperate with gravity by leaning in to in, in a forward fall, and with the oncoming road, by swinging your legs rearward, instead of striding out ahead of the body. Striding out to the front, causes heel striking, which is breaking your moment, as well as setting you up for injury. Moving from Your Dantien – Did you even know that you had a dantien? In Tai Chi, a dantien is the storage center for your chi, or life force, and it is located near your body’s center of mass (three finger widths below your navel). You can imagine it as a glowing tennis ball. In conventional running, you initiate movement by pushing off, using small muscles/tendons in the low leg and foot to do the big job of propelling the weight of your body forward. In ChiRunning, you innate movement by focusing on your dantien, and moving from your center. Moving your center of mass, or dantien, ahead of your feet, creates a forward fall. As long as you continue picking up your feet, you will continue to move forward. Gradual Progress – Any time you are making a change in your running, your shoes, your technique, your mileage, you’ll be most successful if you apply the principle of gradual progress. This principle states that everything that moves through developmental stages of growth must do so gradually and sequentially. Breaking this rule will inevitably lead to some level of failure, in this case, most likely an injury or frustration and disappointment. If you’d like more of an introduction to ChiRunning, signup here for three free videos from Danny Dreyer. You can also join me for classes starting in April, more details here. Long may you run! ← Group ChiRunning/Walking Classes Starting in April!